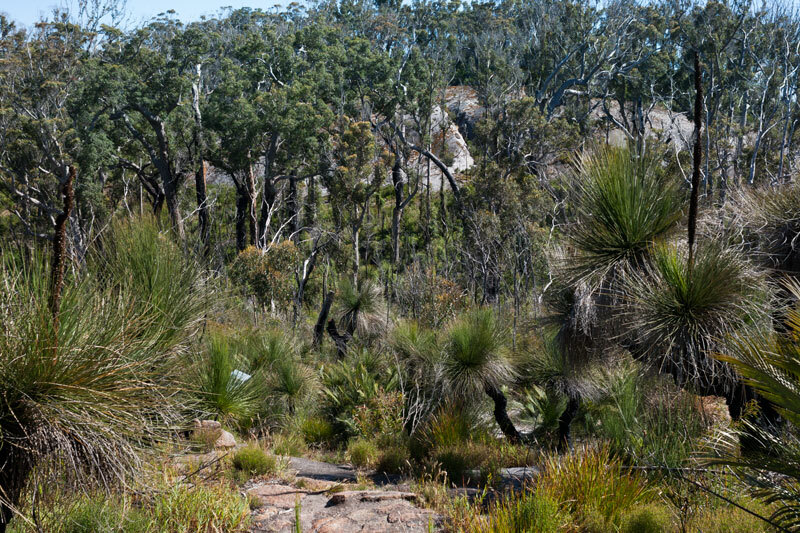 Mount Chudalup, an ancient rock form in the karri forest promises some spectacular views to anyone who reaches the summit. Seeing as we were staying at a local camp ground, we planned to cycle 11 kilometres to the trail head and hike to the summit. We set out reasonably early taking advantage of some good cycling conditions which means low light, no wind and less cars on the road. Our backpacks stocked with plenty of water, trail mix balls, bananas and cameras. The ride would offer little shade so we were keen for the early morning start to avoid the UV rays later on in the day. 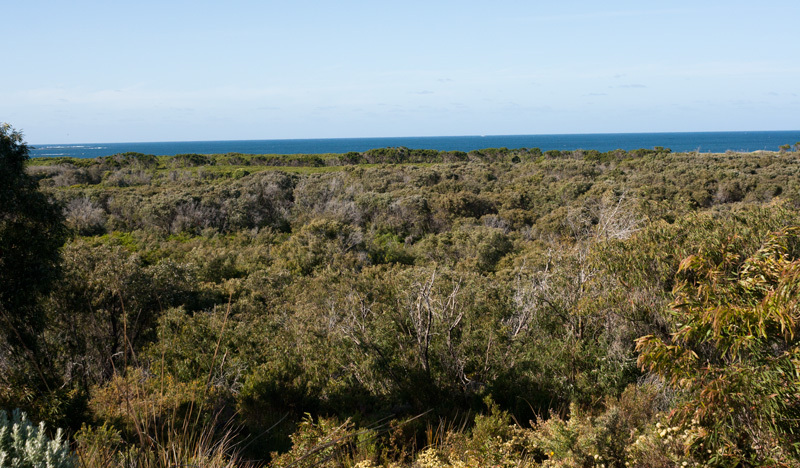 Expansive coastal heathlands lie either side of the flat road in the D’Entrecasteaux National Park. What lies out there? What animals have travelled through? 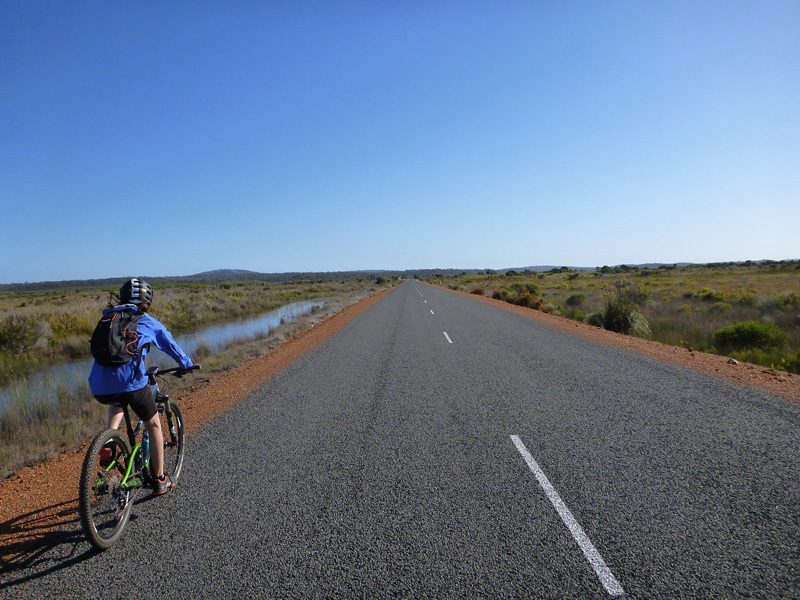 With ideal cycling conditions the ride pans out quite smoothly and without flies, we’re both in high spirits. We were surprised to hear loud frog chants along the road in the small watering holes. The flat horizon ahead, a familiarity of the Australian landscape seemed to never draw close and the green went on forever, so it seemed at the beginning anyhow. 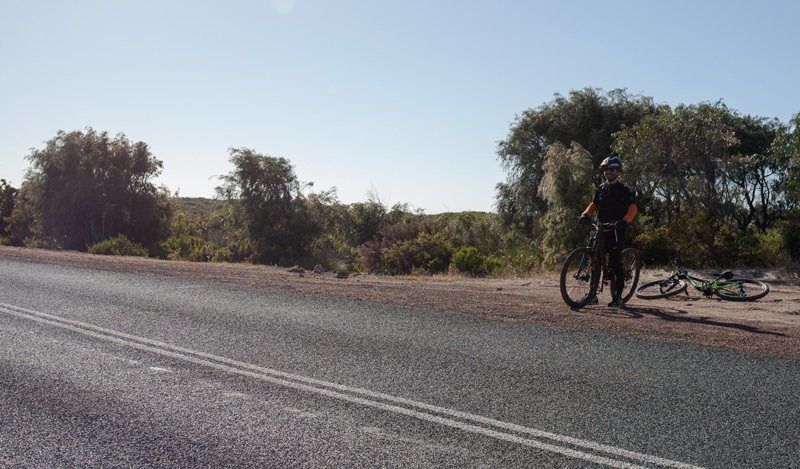 On the bikes we notice every detail and unfortunately we discover many alcoholic glass bottles and cans thrown to the side of the road near settlement. Aside from littering being illegal in W.A (keep Australia clean people) the glass bottles pose a very real fire risk and death traps for small animals like lizards. 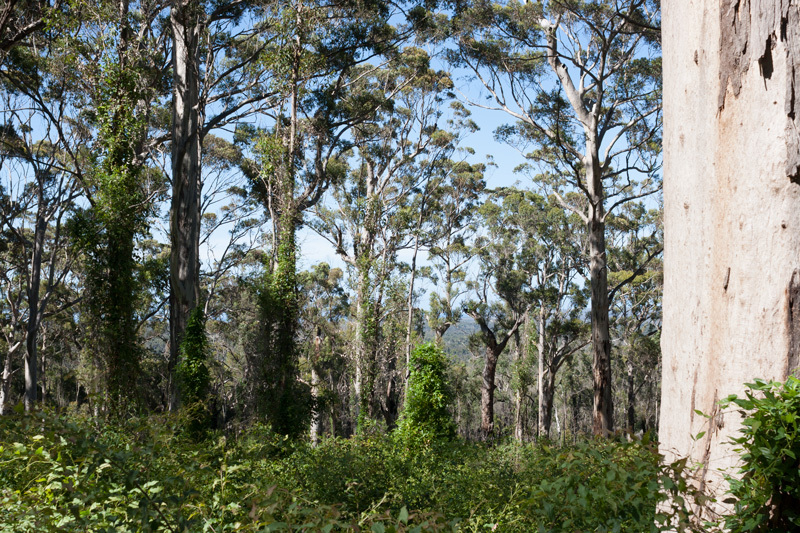 We approach a section of eucalyptus forest and the cool shade is welcomed from the canopy of trees. Cycling the mountain bike is comfortable and also means we are able to move over and onto the dirt section when cars approach. 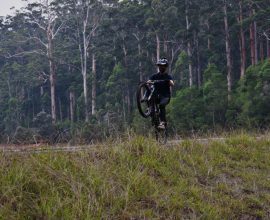 The bike excels on the dirt section, as a mountain bike should. Thank you Liv! 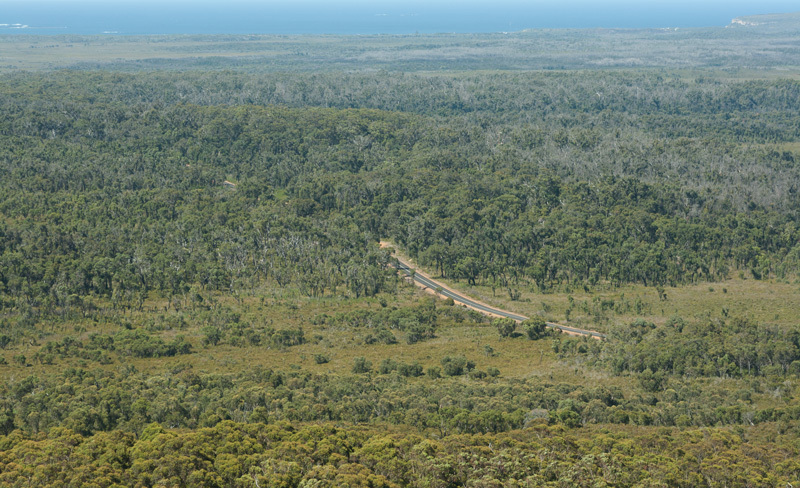 In 2015, a fire ripped through the area stretching from the outskirts of Northcliffe to Point D’Entrecasteaux. 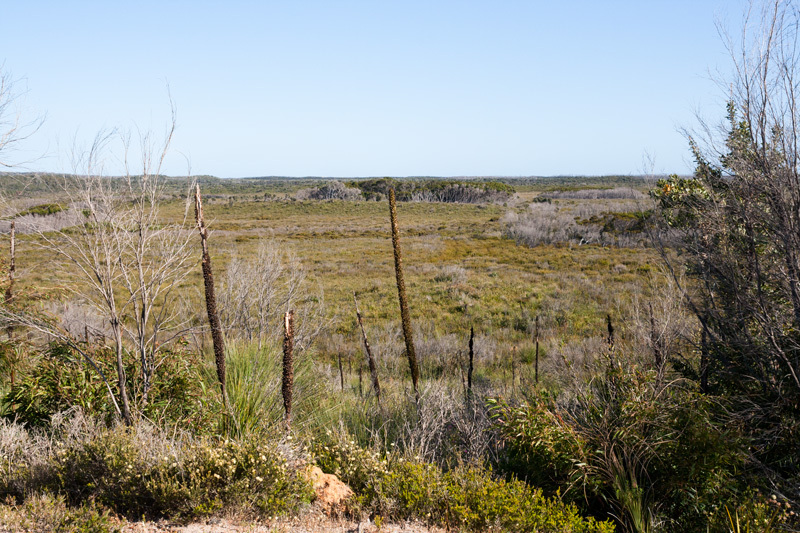 On the tail end of this devastation, signs of recovery are good, the native Australian flora responds quite well to such landscape challenges, regenerating from charred remains. 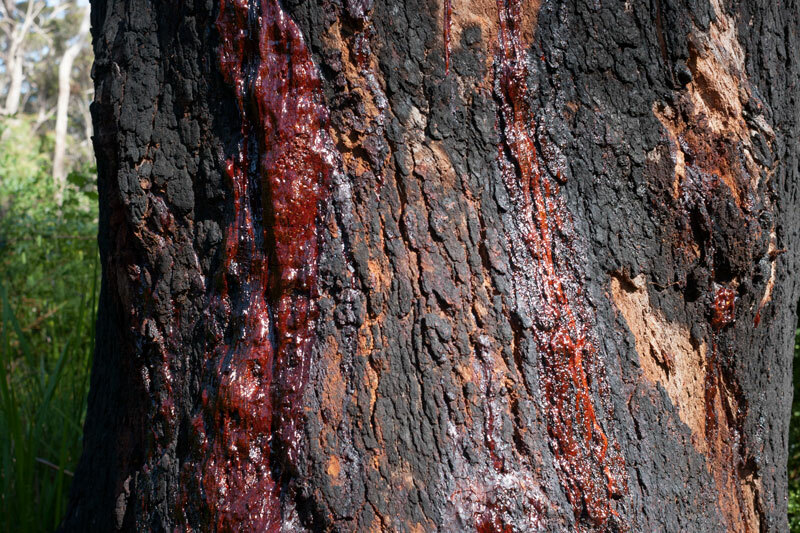 Most eucalyptus trees can seed following a fire and the more I learn about the uniqueness of native Australian flora, I begin to question why it’s more popular to plant non native plants? Eerily we are able to view the height of the fire by looking up at the tree tops. 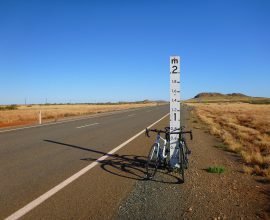 The last stretch of road involves an uphill, leg burning effort and the sign ahead for Mt Chudalup turns into our temporary finish line as we race towards it. 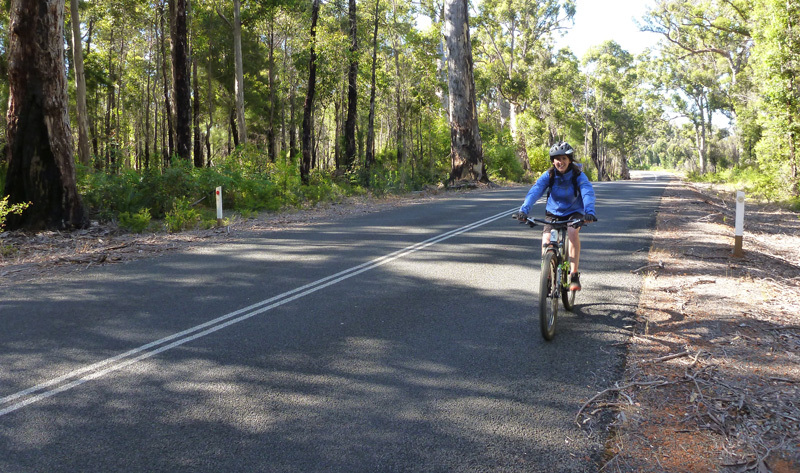 The entrance to the trail head is grand, a beautiful dusty dirt road into the tall Karri forest. 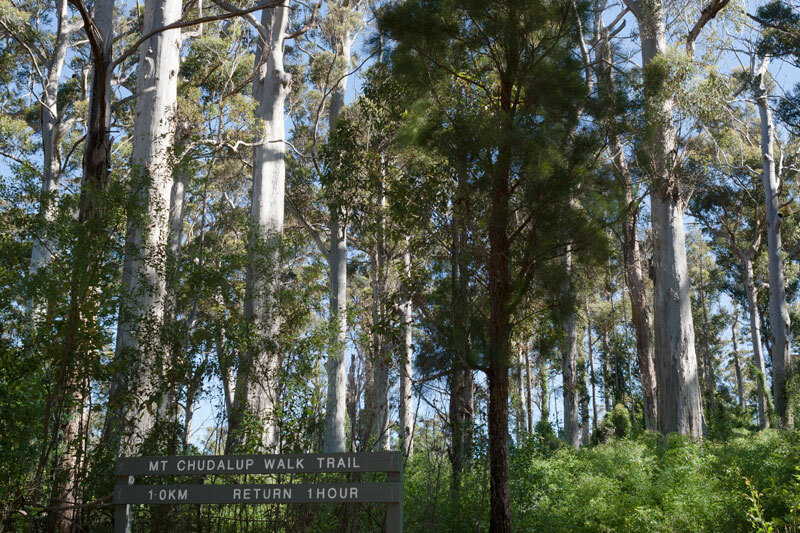 Shaded picnic and toilet facilities make Mt Chudalup a great rest spot, the trail head is quite easy to access with a 2WD car too. 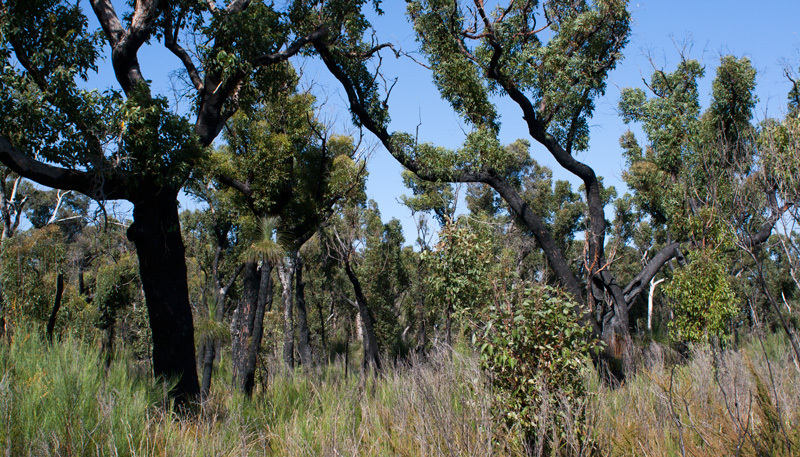 The forest around the trail is predominately Karri and Marri trees and we spot a surviving marri along the way, it’s alive under the charred exterior. Signs of the 2015 fires are present along the trail and I’m hoping the grass trees close to the summit survived because they were so beautiful last time I saw them. The understory of the forest canopy borders the first section of the trail. The forest opens up when we begin walking on the granite rock form. 40 million years Mt Chudalup was under water and there are a few sign boards along the way to read about the unique nature of this place. 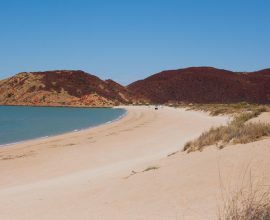 As we learn, the landscape on the rock form changes, winds sweep sand and soil onto the rock and the grass trees have thrived. Random steps and a steep section keeps us working upwards. A small flat board walk provides a breather before the final climb, it is also a good spot to take a photo looking down the trail already travelled on. 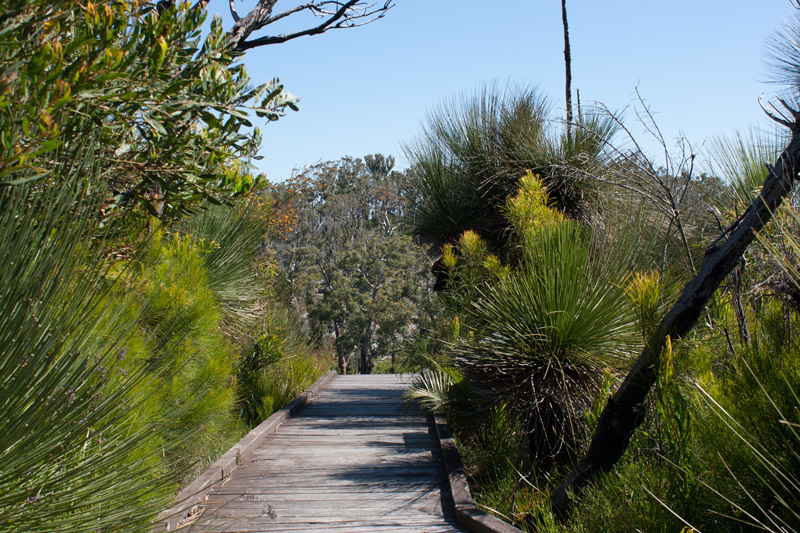 Just before the last section of steep walking, the first of many views is revealed and I’m happy to see those grass trees have survived. My favourite view of the day. 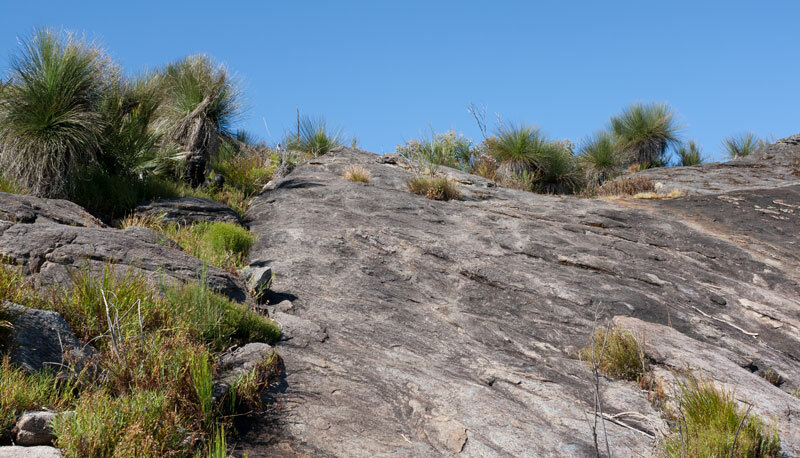 The steepest part of the trail lays ahead and as photographed below. It’s easier to scramble up in summer when the surface is dry, in winter the terrain can be quite slippery but still treadable with care. Moss and lichen can be found through this section. I’m falling behind taking photos and Derek has made it to the top already. A cloudless day and the blue sky shows off in all the photos. 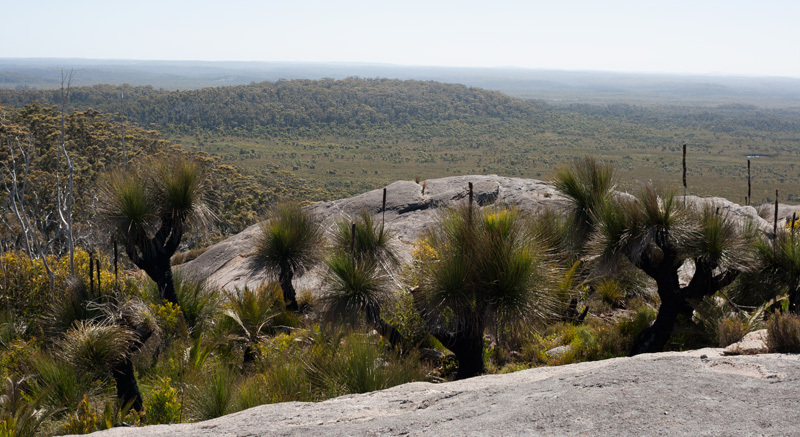 The flat summit of Mount Chudalup has plenty of room to take in the amazing views in all directions. A sign will warn you of cliff risks, just beware of sharp drop offs and heavy winds. Other than that, just like the Gloucester Tree in nearby Pemberton, it’s all good for the micro adventurist! The summit may not be that high at 187 metres above sea level, however I think you’ll agree with me, the view is simply superb. This is one view and I’ll let you discover the other ones on your own visit. Scampering down the rock, we come across a Polish couple and we chat about their Aussie road trip and as they saw the mountain bikes below they talk about the mountain biking scene in Poland! They are having such a great time in Western Australia that they’ve forgotten what day it is, oh to be living like that! They warn us of a snake, telling us exactly where along the trail it was spotted. We chat for some time and say goodbye 3 times before the conversation enthusiastically picks up again. We could chat about this area forever, though it’s getting hot, so on the fourth farewell we leave them to finish their journey to the summit. On the way down, Derek spots a snake further along in the forest section. It is well gone before I meet up with him which I am a little disappointed about because I wanted to see one. We greet a couple in the car park stepping out of their motorhome and mention the sighting, they decide to change into sneakers which we think is a good idea. It’s quite warm now and the reptiles do enjoy a sunbath, they generally move away from the path when they hear you approaching and by sticking on the trail and keeping an eye out prevents any mishaps. The trail is free from debris and quite clear. The return journey on the bikes to settlement feels quick and we enjoy descending the hill we climbed earlier to the trail head. 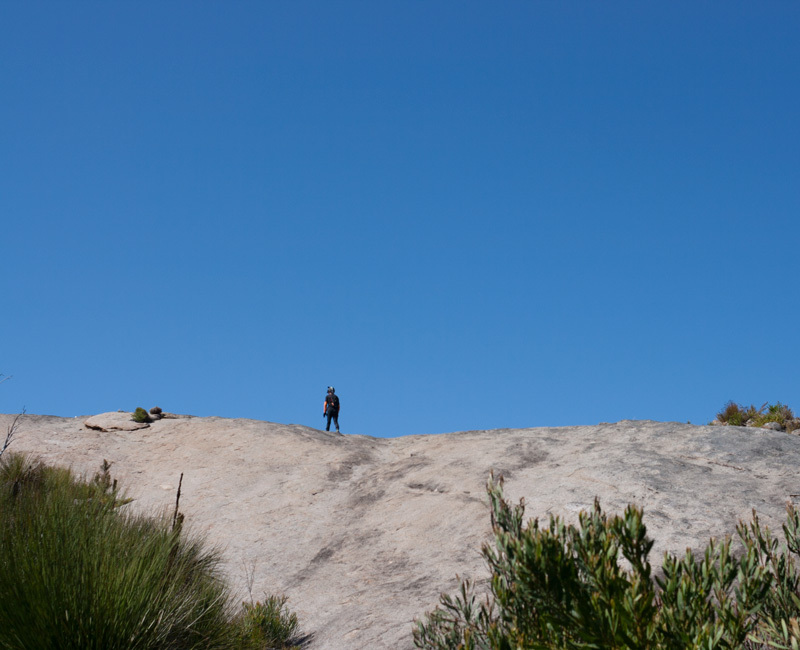 The highlight of today’s journey is seeing so much diversity in a relatively short distance – sandy coastal heath lands, granite boulders and tall majestic karri forest. Course, the views on the summit were sensational too! 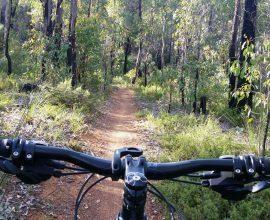 Mountain biking continually introduces and inspires us to new challenges and experiences and I’m super glad I gave this ride a go even though I woke up this morning with excuses of the wind and hot conditions. Hiking the summit was the icing on the cake to a great day out, afterwards we indulged in a nap by the ocean followed by a local red from Hillbrook Winery.